gray skies and the rain, and fog. blue and sunny days somewhere else. Well, I think better weather is on its way. EASY PROJECT I'm doing the coasters, love this, from Martha Stewart. Love the dresser, even I can do this, just match it carefully, decoupage, it and voila!!!!! I would love to do a door like this????? From the "Craft" magazine a great easy project, your coffee table decoupage map. Subway maps from the Ma. Transit posters. Great idea!!!! 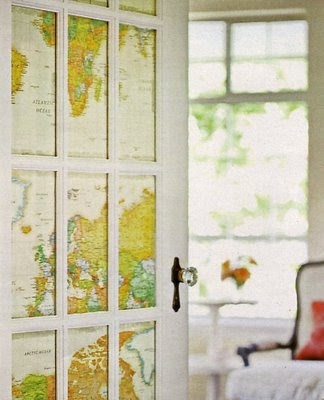 maps as blinds so cool!!!!! 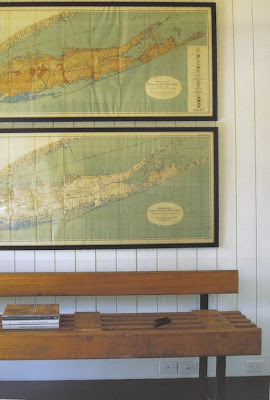 just get old maps from schools, yard sales, antique malls. From Casasugar site, great idea put them all together, big, small ones.they look great in a grouping. Great ideas for a room!!!! CREATE, CREATE. You can do it. Crafting, painting, decoupage, is so relaxing. Blessings from our God to you all!!!! Thanks for sharing! I LOVE maps and one day we hope to have a "magellan" themed nursery with lots of maps. I especially love the idea of pull down maps as shades!